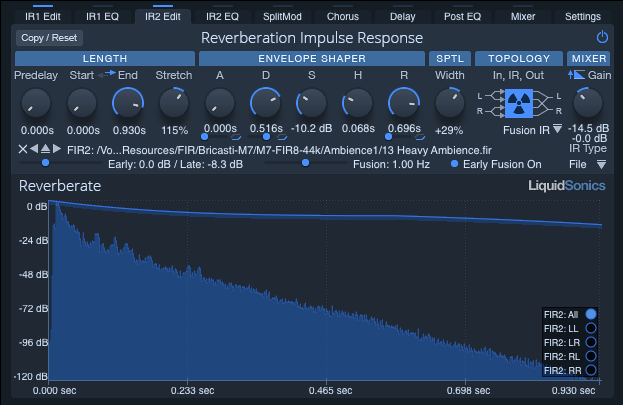 Dafna Naphtali just posted a question about an affordable IR reverb that would be less pricey than Altiverb. I agree with many of the posters that stated that Altiverb is worth every penny - it's an amazing piece of software. But I've needed to do the budget IR thing in the past, and also sometimes want a lighter-weight plug-in that still gives me decent flexibility. For that, I turn to Liquidsonics' Reverberate2 (shown above). This is a sweet little IR reverb with tons of controls, but is relatively light-weight on my MacBook, integrates with all of my software equally well, and is very accepting of even my weirdest IR files (thanks, Spirit Canyon - wherever you are!). This actually has a nice place in a few of my Max-based performance rigs, and is a great alternative to overuse of the Valhalla reverb - something I could easily be accused of doing. Reverberate and Valhalla Room are two of my main verbs in my DAW, Bitwig. Thanks for posting this Darwin, and acknowledging Reverberate, it's a good one!